If you played the original Dead Space, it’s unlikely you’ll have forgotten the mining ship USG Ishimura. Hanging in the blackness above Aegis VII, with its crew transformed into monstrous Necromorphs, the giant planet-cracker was a hell in the heavens from which engineer Isaac Clarke managed to escape, losing his girlfriend and his mind along the way. Dead Space was as cleverly constructed a game as there’s been in recent years. By merging its original ideas with seminal ones borrowed from the likes of Alien, 2001, Event Horizon and Resident Evil 4, it memorably blurred the boundary between survival horror and action games. Unsurprisingly, Dead Space 2 delivers more of the same, albeit with some subtle but significant improvements that make it a stellar title in its own right. 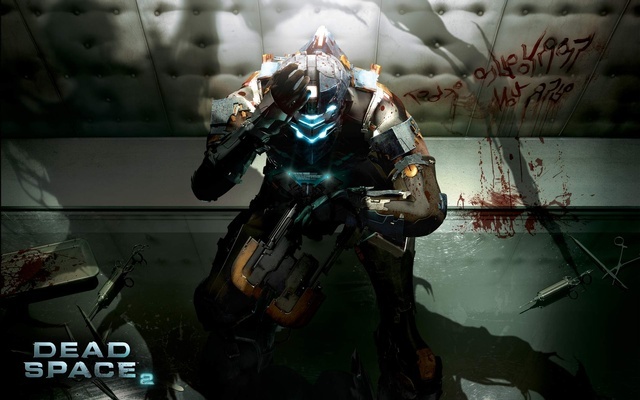 Set three years after the Ishimura catastrophe, Dead Space 2 begins with Isaac waking in a hospital on the Sprawl – a vast city on one of Saturn’s moons – just as it’s being overrun by the Necromorph hoards. Trapped within the constricting embrace of a straitjacket and with a gigantic black hole in his memory, my first job was to help Isaac escape the medical facility in a heart-pounding sequence that immediately introduced me to the feelings of anxiety and panic that would stalk me throughout the rest of the game. By its very nature, the Sprawl is a much more varied setting than the Ishimura, which, despite the grim continuity to its constant metallic corridors and cavernous industrial spaces, many players found increasingly dull as Dead Space progressed. From a ransacked shopping centre to the sinister opulence of the Church of Unitology and the eeriest elementary school in the galaxy, developers, Visceral Games, perfectly bring an atmosphere of death and hopelessness to everyday places which should be teeming with life. Even the light of the sun seems to feel inexplicably cold as it filters through the giant observation windows you periodically encounter. Just like its predecessor, Dead Space 2’s horrors are ruthlessly calculated and as cerebral as they are visceral. The game repeatedly builds tension by forcing you down tight corridors and trapping you in sealed rooms littered with classic signs of foreboding – temperamental lighting systems, ominously whirring machinery and liberal numbers of meaty corpses – until the action suddenly explodes into brutal crescendos of sound and fury as Necromorphs burst out of vents in ceilings and walls. Despite the futuristic setting, it’s a master class in using the most primeval survival urges and haunted house-style scares to keep you constantly on edge. The immaculate game design extends to the user interface as well. While in other games the HUD and in-game menus pull you out of the experience, in Dead Space the elegant integration of Isaac’s health and stasis meters into his engineer’s suit, and the way inventory menus and video messages are holographically projected, really adds to the immersion. Without doubt, however, the most impressive thing about Isaac’s Rig are the new thrusters that allow him to move freely in zero gravity environments. In the original Dead Space, Isaac could do nothing more in these areas than launch himself from one solid surface to another. Now he has freedom to jet around as he wishes, with the sense of weightlessness and beautifully tight controls making these sections of the game real highlights. Perhaps my favourite zero-g moment in the game was taking Isaac on a spacewalk to repair the Sprawl’s giant solar arrays. As with many of Dead Space 2’s simple but appropriately engineering-based puzzles, it required me to combine deft thruster controls with Isaac’s kinesis and stasis powers to manipulate objects and slow their movements. And once the hard labour was done, the game dropped me seamlessly into a stunning action set piece. In the original Dead Space such transitions, like the trundling tram rides at the end of each level, were often jarring. Now, in DS2, the gameplay flows almost seamlessly and advances from one chapter to the next are so discreet you may not even notice them taking place. In fact, Dead Space 2’s action moves at such a pace, I found it hard to think of it as a survival horror title. On all but the toughest difficulty settings, ammo and save points are plentiful, as are the shops where you can stock up on supplies and the workbenches where you upgrade your Rig and weapons. Isaac even moves with a hefty nimbleness, and while you aren’t going to find him donning top hat and cane and chasseing around in front of a chorus line of high-kicking Necromorphs, neither is controlling him like driving a tank. As much as Dead Space 2 has distanced itself from the old survival horror conventions, there’s still more tactical depth to the combat here than in many action games due to the need to dismember enemies to kill them. With the constant battles in confined spaces, successfully pruning the Necromorphs’ limbs requires you to remain calm, prioritise your targets and use stasis to render foes momentarily statuesque, like some gruesome Damien Hirst installation. Most importantly, thought, you need to select the appropriate weapon. And while Isaac’s improvised arsenal has been bolstered by the Javelin Gun, whose spears can pin enemies to walls, and the high powered Seeker Rifle, I still found myself returning to old favourites like the Plasma Cutter, Line Gun and Ripper most of the time. For me, the enemy designs in the first Dead Space were slightly hit and miss, so it was nice to see a greater diversity to the Necromorphs in DS2. While the crawling infant Necros with their explosive, distended stomachs and the stampeding adolescents both made me feel slightly uncomfortable, it’s the Stalkers that are the most intriguing new adversary. Looking like a cross between a Velociraptor and a rubber chicken, these savvy creatures hunt in small packs and use cover intelligently to get close to you before making a final, kamikaze charge to try and bowl you off your feet. As the story twists and turns this way and that, Isaac, tormented by the ghosts and guilt of his past and the pursuit of the Necromorphs, slides closer and closer to insanity. Towards the end, the narrative does become decidedly uneven, with some eye-popping moments undermined by blatantly recycled elements. But the fact that Isaac speaks this time around, and even displays signs of a dry sense of humour, does help endear him to you and heighten the impact of the final scenes. Once you’re done with the single player, Dead Space 2 does, of course, offer a multiplayer mode, which has been the source of a certain amount of consternation. Pitting two teams of four players against each other, one side takes on the role of the Sprawl Security Team, charged with detonating a bomb, reaching a set of escape pods or completing some other objective, while the other has the choice of four different Necromorphs with which to stop them. There are only five maps, but there is a levelling system that rewards you with improved kit, and while it’s unnecessary and pretty rote, it’s a distinctly different piece of additional content whose simple, communal fun in no way taints the Dead Space experience. It’s unlikely however, that anyone will be buying Dead Space 2 for its multiplayer. The single player campaign is the draw here and the feelings of isolation and desperation, shock and solitude it delivers create a sense of claustrophobia that’s almost suffocating. 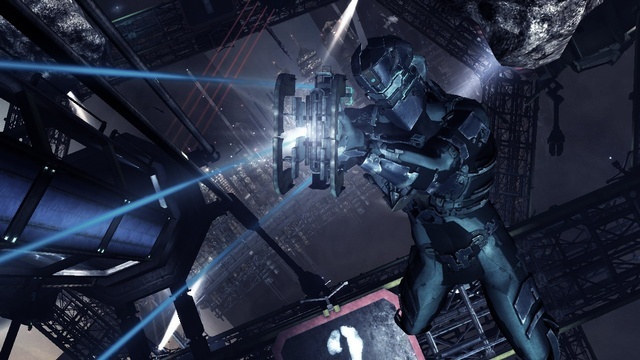 Dead Space 2 is unlikely to win any prizes for originality and, as a result, despite all the chaos and terror on screen it feels like a very safe sequel. It’s still one though that will frequently leave you gasping for breath and, on more than one occasion, take it away completely. It’s a game that, like the body of a dismembered Necromorph, is the result of some precision execution.